The Summer of Arcade concludes this week, with TMNT: Out of the Shadows leaping from the sewers to cap off the four week event. 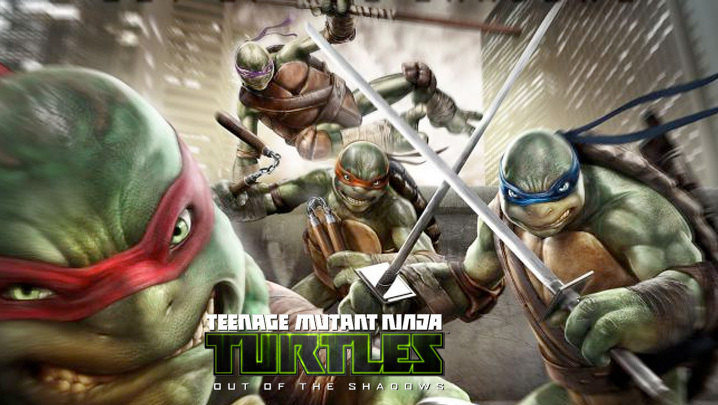 I spent a short time with TMNT:OOTS this morning, and will have a full review available later this week. I should probably preface this with how much of a TMNT fan I am, like any good child of the 1980s – and I have always judged Ninja Turtle titles based on TMNT: Turtles in Time. Watching the opening licenses scroll by, you’ll see Nickelodeon and lastly Unreal Engine. Huh, I wonder how this will go. My first impression was one of surprise – the artwork in the menus looks really slick. The scene you see with the four brothers on the rooftop would be a great desktop background; but we’re moving on for what looks like a solid XBLA experience. Starting the campaign, you’re not given a cut-scene, but dropped into a sequence where you play as April O’Neil (not a first, see TMNT: Smash Up or TMNT: Mutant Melee). Some unplanned lasers and explosions later, you’re given a tutorial through a warehouse. April moves surprisingly ninja like which I found a little odd (it turns out in the current 2013 iteration of the TMNT cartoon, April trains with Splinter to be a ninja) but was more off-put by the poor frame-rate in the opening sequence. Don’t get me wrong, this game looks nice. But the frame rate was up and down for the first couple of sequences I played. Eventually you get to play as the titular brothers, and I should point out as nice as the artwork is, I think the design on the Turtles heads is strange looking. With the existing cartoon doing well with kids, I figured this would have been developed with that style (which is CG anyway) but they’ve gone for a darker look, that doesn’t quite click for me. I found a training mode and multiplayer to play around with eventually. The combat is similar to the Batman group-combo-counter system, albeit slower. I haven’t mastered this yet, but the game lets you toggle between the Turtles to string more combos. The worst part as in most is the camera, which doesn’t pan back in combat. The little stealth area I played through made me realize I want a TMNT stealth only game, but maybe OOTS will give me more opportunity. I’m hoping to become more accustomed to the combat controls in my next play-through. Review to come, until then, check out the trailer below. PS: I’m still upset that Rob Paulsen doesn’t voice either Raphael or Donatello in this game.